Growing up, I used to explore the woods and fields around our house. I spent long hours observing and wondering. Often, my dad would take the time to explore with me or answer questions I had. I didn’t realize it, but we were doing nature studies. In school, science was my favorite subject. I loved the observing, questioning, and finding the answers. To me, it was just like my accidental nature studies. Nature studies are still my favorite way to study and teach science. Studying science in this way has so many benefits. Here are 5 reasons children should study nature. 1. Nature study teaches children to appreciate nature and the world around them. Have you ever seen a young child stop everything, squat down, and stare in wide-eyed wonder at a caterpillar on the sidewalk? They are captivated and in love with what they see. In that moment, they start to appreciate nature. As they continue to explore the natural world and interact in it, they realize they are part of it. Their love and respect for nature grows. When this child grows up, he or she is more likely to continue their appreciation and show concern for nature and the world around them. 2. Nature study encourages investigation, a crucial concept of scientific study. Have you or your children ever picked up a large rock or log to see what was living underneath it? Have you ever looked at bugs under a magnifying glass? Nature gives the opportunity for wonder, exploration, and investigation. Scientific study is based on these activities. The more children are exposed to nature and encouraged to explore and wonder, the more likely they are to actively investigate. These are skills needed for advanced scientific study. When they are learned in a natural way, like through nature studies, they are more easily recalled and applied. 3. Nature study is easy science. Studying nature requires no special equipment or books. Sure, you can use a magnifying glass or a field guide to enhance your study or go deeper, but it is not necessary. Just get outside and observe! Take a walk in your backyard. What do you see? Observe different plants, insects, and animals. What is the weather like? What do the clouds look like? You don’t need anything special for these activities or to answer these questions. 4. Nature study gets kids outside! My kids need to get outside where there is fresh air and no walls daily just to burn off energy. From talking with other moms, most kids are this way. It’s hard for kids to sit and concentrate on school, or anything else for that matter, when they are bouncing in their seat ready to explode from the powder keg on energy they seem to be holding within. Getting kids outside gives them space to run and play to use up their physical energy and a space to explore to use their mental energy. Spending time outside makes healthy kids, too. In this world of video games and scheduled, structured activities, kids don’t get outside they way they used to. The result is obese, unhealthy kids. The more time they spend outside, the healthier they are. Nature studies are great excuses to get kids away from those video games and electronic devices and outside into nature. They are a great way to blend the physical and the mental. 5. Nature study gives children a base of knowledge on which to base other science studies. As children study nature, their observations cover many scientific disciplines. Take studying birds for example. You might spend an afternoon watching a bird build a nest. As you watch, you notice the appearance of the bird and the shape of its beak. This gives you clues to what the bird eats. As you watch the bird bring back building material to its nesting site, you wonder why it chose this spot and wonder why it chose those materials. Think about the habitat and the weather. Watching the bird fly, you might wonder about its feathers, its flight patterns, and the aerodynamics involved. When children have this kind of base knowledge and questions already in their minds, studying related scientific disciplines becomes exciting and an extension of their nature studies. I wrote a chapter in The Big Book Of Homeschool Ideas all about nature studies. I included tips, ideas, and resources. 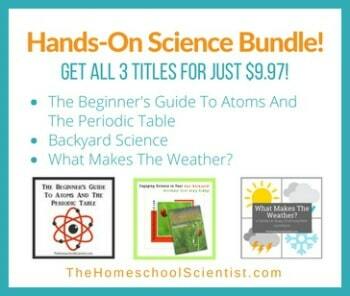 Get my nature study information, plus information on over 100 other topics from 55 other homeschool moms. Yesterday on the tour, Janine from True Aim Education shared her passion for character development and free character printables. She is also giving away a character ebook set. Tomorrow, Jennifer from Forever, For Always, No Matter What, author of the chapters Homeschooling in a Large Family and Homeschooling through a Move, will be blogging about why she chose those topics and giving away a couple Florida learning resources. We look at bugs and tadpoles, but we don’t really study nature like we should. We do informal nature study all of the time. My oldest is a huge animal lover and that has prompted all of us to be more observant! We are actually doing a beginner nature study on birds this week with my daughter. She is very excited about it and loves reading about the different types of birds, hoping to see some. Last week we studied a caterpillar for the week. So fun, and I love to watch her absorbing the world God made. Sounds like you are having so much fun with your nature studies! In your bird study, you might want to consider listening to bird calls. Our kids really liked adding that to our bird study. Learning their calls makes it easier to identify many species. There are several birding apps and websites that have good bird call and song audio.